For over a decade Romanian Cinema has produced many breathtakingly great films, and directors such as Cristi Puiu, Corneliu Porumboiu, Cristian Mungiu and Călin Peter Netzer have gained international recognition, becoming household names in world cinema. The usual term of a "wave" was applied to this extremely creative outcome of films, but now, after such a long time, one has to ask what you call a seemingly never-ending wave. 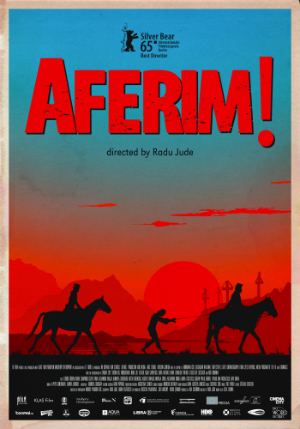 Radu Jude, who has been around some time with two features and amazing short films, offers another stunning effort in filmmaking in his third feature film Aferim!. The title is a Turkish expression, meaning "Bravo," and refers to the time when Romania was occupied by the Ottomans. It is an ironic title for an angry and rough film. The movie is set against the background of Wallachia in the early 19th century and follows two lawmen who happen to be father and son. They try to capture an escaped slave that has been sleeping with the wife of a rich landowner. The beautiful black and white photography reminds of great Western movies and as with John Ford, Jude also plays the legends against the realities without necessarily dividing them. It is just that his characters would not be able to reflect that. Like with most of the previous works of Jude, this is also a film about the burden and misunderstandings in our perception of work and about how dangerous and limited sights are passed from one generation to the next and thus survive in society. There are few films in which one can find so many dreadful statements concerning their political and moral weight. But the obvious satirical aspects of Aferim! get a decisive turn as many characters in the film appear highly human and the dreadfulness is just part of a historic context. This is not a comedy, this is helplessness. An over-the-top racist outburst by a priest is at the same time hilariously funny and painfully revealing. The racism of the past, of course, is connected to the racism of today. What seems to be a mere costume drama, featuring a huge number of swear words you would want to learn before going to Romania, is a captivating attack on wrong values and inhumanity in society. Modern Romanian films are often occupied with the past, but rarely do they go back to the 19th century. It is a time of change and a time where the roots of evil may be found. The Roma people lived as slaves then and they are constantly referred to as "crows." But instead of making this a moral tale about guilt, Jude succeeds in creating a wild road-movie with absurd and rough humor. The structure of Aferim! reminds of Hal Ashby's The Last Detail or Albert Serra on speed. In the first half of the picture, father and son ride on their horses through deserts and brambles to find the lost slave. They have random encounters and talks with strangers and progress with violence and ignorance until they are able to find the slave together with a Roma child runaway. In the second half they return the slave to the landowner, drinking, discussing and sharing a prostitute. They get to know the true story behind the slave and begin to feel sympathy for the crow. But again Jude avoids telling a story of changing morals. Instead he shows that sensing something wrong without acting is even worse. The sturdy dialogue is based on historic documents and Jude delivers an amazing effort in making a historic film beyond mere stylization. It is rather exuberant with life and confusion. Especially the mise-en-scène of Jude is noteworthy. Long shots with many people and much going on give him the opportunity to reveal plot details in a very sophisticated manner. There may be the smile of a woman in the background meaning something or a young boy hiding in a shot one has been watching for more than a minute. With his feeling for movement in space and between people Jude achieves something magnificent because, as with masters like Hou Hsiao-Hsien, the action is just a part of a bigger social and historical context. Moreover, we are allowed to watch relations in single shots that are full of respect for reality. 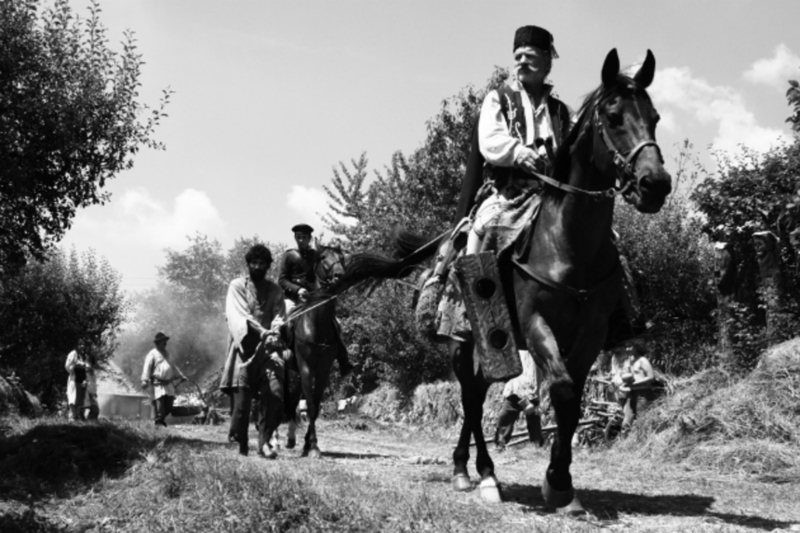 When the father played by a great Teodor Corban climbs on his horse, he will need some time, and when they go or ride from one place to the next, we feel the absurd complexities of life. The powerful rhythm of the film, with all the noise, mud and catchy music, creates a fascinating disdain that never feels cold. It is almost unbelievable how a country like Romania is able to have such an amazing production outcome in terms of quality. Aferim! is another must-see film and it certainly would deserve an award. Review originally published during the Berlin Film Festival in February 2016. The film opens in select theaters in Los Angeles, New York, and San Francisco on Friday, January 22, via Big World Pictures. AFERIM! (dir. Radu Jude, Romania/Bulgaria/Czech Republic)--Official US trailer--OPENS JAN. 22 IN NYC, LA AND SF! from J. Howell on Vimeo. Official U.S. Site: Big World Pictures - AFERIM! I just watched this tonight at the Spokane International Film Festival. I was - am! - thunderstruck. Utterly transportive, exquisite, unabashed... and deeply affecting. To see how far we have all come a couple of centuries, and yet to see such bygone history still dogging our contemporary steps. Everything has changed, and nothing has changed. So much about life is grey, yet some things - like the value of human life - are simply black and white. Yet still today it seems we cannot tell the one from the other, or see black and white in the wrong places. Thanks for your review. I look forward to chasing down some of the other filmmakers you mentioned.